(CNN) -- President Obama took on a more prominent role in the debate over health care Thursday, holding a town hall meeting in a state that's been pushing for an overhaul of the system for years. 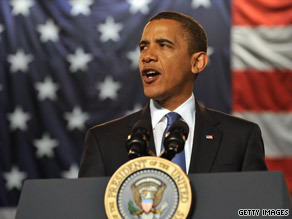 President Obama takes his push for health care reform to Green Bay, Wisconsin. Obama spoke with voters in Green Bay, Wisconsin -- a city that's had results that Obama hopes to replicate. "We need to identify the best practices across the country, learn from the success, and replicate that success elsewhere," the president said at the town hall meeting. Green Bay offers what the Obama administration sees as a high-quality health care at costs lower than the national average. Obama said the success of Green Bay was partially due to the fact that doctors have been working together as teams to keep costs down and provide the best care available. "And because they're coordinating, they don't order a bunch of duplicative tests. The primary-care physician who initially sees the patient is in contact with all the specialists so that in one meeting, they can consult with each other and make a series of decisions. And then they don't over-prescribe," Obama said. A lot of decisions can be made, such how quickly someone can leave the hospital, that will improve quality and increase coordination while lowering costs, Obama added. Tackling health care reform is Obama's top domestic priority for the remainder of the year. He has asked Congress to send him a bill no later than October. What Green Bay has achieved -- better results for less money -- is what Obama hopes to achieve with the sweeping health care legislation. The Dartmouth Atlas of Health Care, run by the Dartmouth Institute for Health Policy and Clinical Practice, conducted a 15-year analysis of Medicare spending and found that increased spending on patients did not lead to better health. "We have the most expensive health care system in the world," Obama said Thursday. "But here's the thing, Green Bay: We're not any healthier for it. We don't necessarily have better outcomes." The debate among lawmakers over how to take control over the rising costs of health care echoes sentiments heard two years ago in Wisconsin, when the state Senate pushed for a universal health care plan. Elements of that plan are similar to what Obama has outlined for nationwide reform. The major divides in Wisconsin were over how to pay for the program and what role the government should play. The measure, known as Healthy Wisconsin, passed in the Senate but eventually stalled over funding. The Healthy Wisconsin plan would have provided coverage for all residents of the state not already covered by another government plan, like Medicare. Those using the plan would participate in a health care pool, where they would chose from a number of plans. A government board would have served as the referee, choosing plans and establishing guidelines for coverage. The plan would have been financed by a payroll tax on workers and their employers, replacing premiums and other payments for private health insurance. "What Obama is doing is very similar to Healthy Wisconsin," Democratic state Sen. Kathleen Vinehout told the Chicago Tribune. "We didn't have a public option, but we had the same idea, which was plans competing against each other." Obama and some Democrats have voiced support for a government-sponsored option, but Republicans say that's a deal breaker. Conservative Democrats say a public option should only be considered as a last resort. One possible compromise that emerged Wednesday was a proposal to create privately operated health-insurance cooperatives as an alternative to a government-run health care plan. The nonprofit co-ops, based on the model of electric, agricultural and other cooperatives in rural states, would be run and paid for by its members, although an initial infusion of federal funds might be needed to get them off the ground, senators said. Obama has outlined his goals for health care reform but left the details up to Congress. Thursday marks his first public forum on the topic. Now, Borger said, it's time for Obama to take ownership of the health care debate. On Monday, Obama will continue his push with a speech before the American Medical Association.